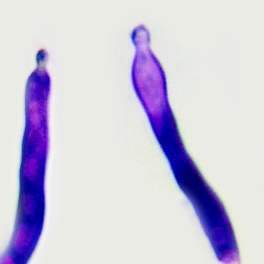 This is one of a group of several purplish brittlegills that can only be separated with any confidence in the field by using chemical tests. 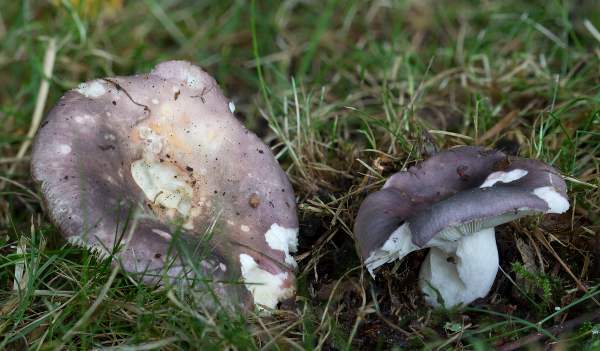 Slugs love to eat brittlegills, and this lovely species seems to be right at the top of their 'must-munch' list. I have yet to find a perfect specimen, and looking through my many mushroom field guides I have not seen a single specimen without slug damage. It seems intact Oilslick Brittlegills occur only in paintings - but let's keep on looking out for one! This beautiful brittlegill is fairly common in broadleaf woodlands and under oaks and beeches in parkland throughout Britain and Ireland as well as in many other parts of Europe including France and Italy. The Oilslick Brittlegill was first described scientifically in 1952 by the French mycologist Henri Charles Louis Romagnesi (1912 - 1999), who gave it the binomial name Russula ionochlora, which remains its accepted scientific name. The only synonym likely to be seen in field guides is Russula grisea var. 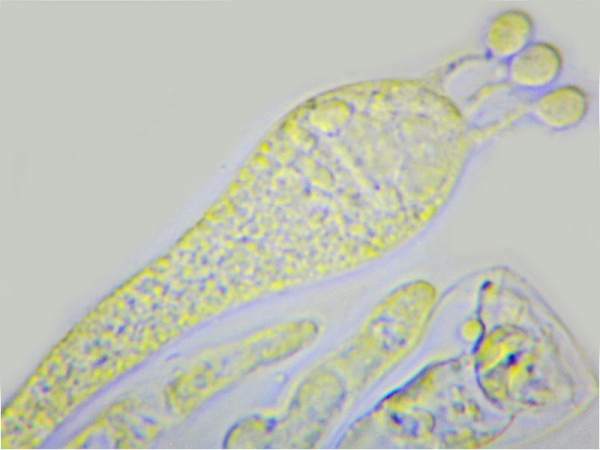 ionochlora (Romagn.) Romagn. 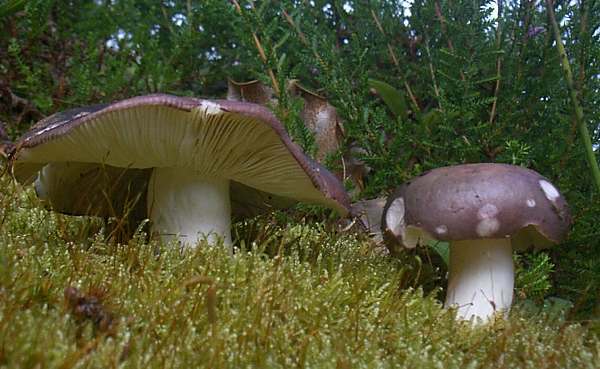 ; however, in the past this brittlegill was often referred to as Russula grisea. 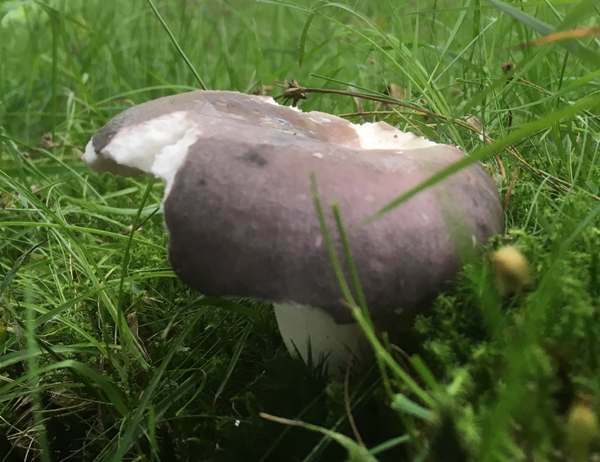 Russula, the generic name, means red or reddish, and indeed many of the brittlegills do have reddish caps (but many more of the brittlegill mushrooms are not red, and several of those that are usually red can also occur in a range of other colours!). The specific epithet ionochlora comes from the Ancient Greek ión meaning 'going' and khlōrós, meaning 'pale green'. The common name reflects the fact that cap colours often merge as in oil spilt onto water. 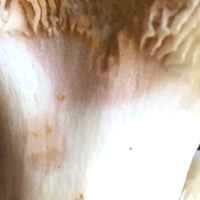 4.5 to 7.5cm across; various pastel shades of purplish brown, pink and vinaceous yellow-green; convex, flattening and developing a depression; surface dry and matt; cuticle peeling typically 1/2 to the centre. 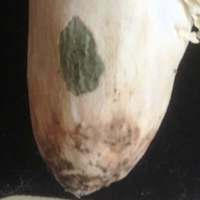 Flesh below the cap cuticle is pale pink. 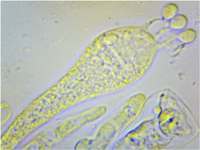 Distinguished by cylindrical to sub-clavate dermatocystidia some of which may be capitate (left). 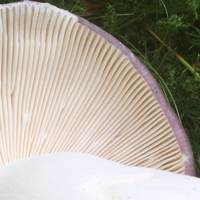 Pale cream, adnate, crowded, some forking from points near to the stem; brittle (unlike the flexible gills of Russula cyanoxantha, a brittlegill which can have very similar cap colours). 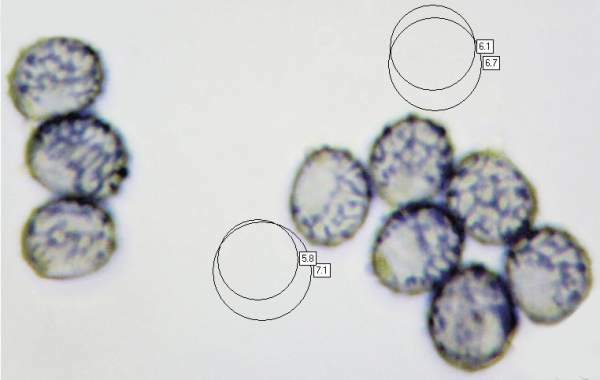 Cylindrical or slightly fusiform to clavate, 3 - 6 cm long and 1.3 - 2 cm diameter; solid, becoming hollow with age; surface smooth or very finely grooved longitudinally, white, sometimes with a faint lilac flush; the firm white flesh gives a positive reaction (left) to Guaiac. The flesh of the Oilslick Brittlegill turns a deep rust pink (left) with iron salts (FeSO4). 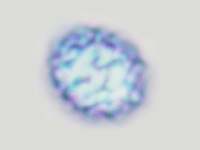 Ellipsoidal, 6.5 - 7.5 x 4.7-6µm, ornamented with warts 0.2 - 0.5um tall not forming a reticulum. 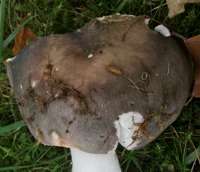 Taste of gills is usually mild, but young caps may have a slightly acrid taste. In broadleaf and mixed woodland, mycorrhizal mainly with oaks (Quercus) and beeches (Fagus) but occasionally with other hardwoods. Russula ionochlora is reported to be edible, but young specimens are sometimes slightly bitter tasting and rated only as mediocre. Greenish-tinged specimens are common and could be confused with the Deathcap Amanita phalloides, which is deadly poiisonous. 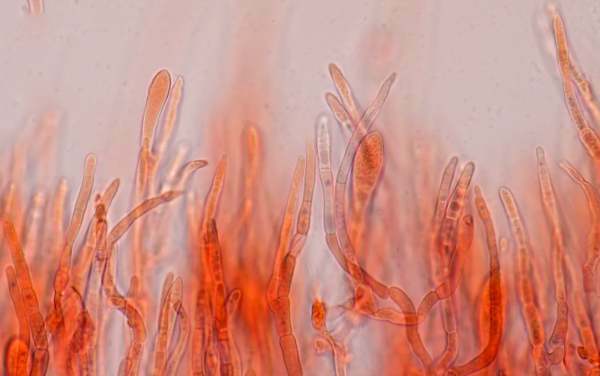 English Names for fungi; British Mycological Society.